A major sports complex in Kent has closed without warning just two years after it opened. Staff at Buckmore Park, near Chatham, say they were told on Monday night the centre would not be opening on Tuesday and they had lost their jobs. Customers were arriving at the centre on Tuesday to find the doors locked. 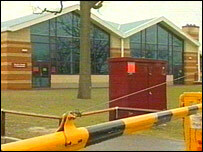 The centre has had £2.9m of lottery money spent on it and had been home to a number of international sporting events. About 20 people are thought to have been made redundant. The site is managed by the Scout Association and says it was suffering financial problems - caused partly by the amount of roadworks close to the centre. Users were turning up at Buckmore Park on Tuesday expecting to use the facilities such as the swimming pool, sports halls or children's party venues. They were met by a sign on the closed doors reading "This sports facility closed with effect from 2200 hours on Monday 31 March for administrative reasons. Further information will be issued in due course." Sean Dalton of Swale Paddle Sport Club ran canoe lessons at the centre for people with disabilities. He said: "It's one of those shocks you don't anticipate having at all. "These facilities should be up and running all the time and open all the time. "If it's just a case of financial implications then hopefully they'll get someone in to sort them out and re-open again." The Scouts Association, which manages the centre, said roadworks on streets around the centre had put people off using the facilities and it had suffered financially to the extent where it could not stay open. David Brake, of Strood Scouts, said: "The roadworks around here had been to the point that we've had at least 10 entrances over the last couple of years. "It changes daily, to the point where the number of people coming into the site has been diminishing. "Some people have actually had so much difficulty getting in that they've actually turned round and gone home again and phoned us to say they couldn't find us." A spokeswoman for Sport England, which gave the lottery cash for Buckmore Park in 1996, said it would be discussing the future of the centre with the parties involved.